You’re properly wondering, what is today’s agenda? I’m glad you are here, as I have another fascinating subject to share and reflect that’ll hopefully ease your curious minds! As part of the blogging 101 course, today’s assignment involves exploring a particular comment that I’ve written for a fascinating or intriguing blog post. The post inspired me to undertake some further research through the Internet in order to understand the differences. 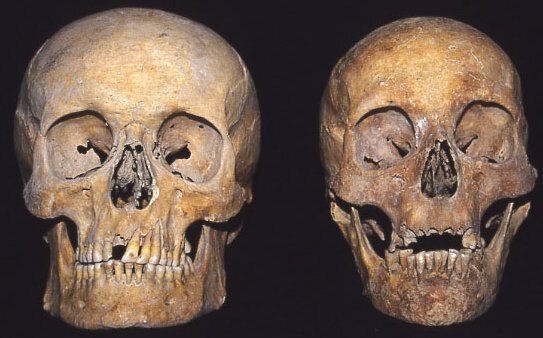 According to Nital Jain, the female skull does feature a circular or round forehead, while the male skull predominately features wider cheekbones, a defined brow line and a prominent “nasal spine.”2 So where do we go from here? The article posted by Craniophiles invited me to consider whether the skull or the subject of death is depicted in the male or the female form? 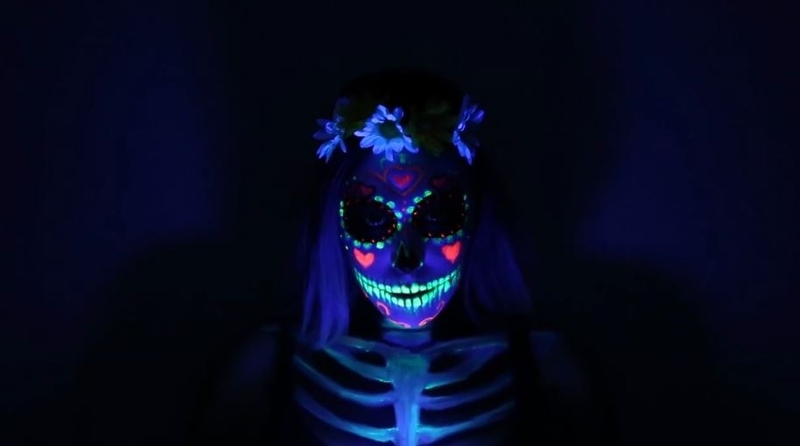 Throughout the years, I’ve discovered masculine representations of the skull as black and white t-shirt designs or merchandise, however there are colourful and feminine sugar skull designs within the contemporary culture. 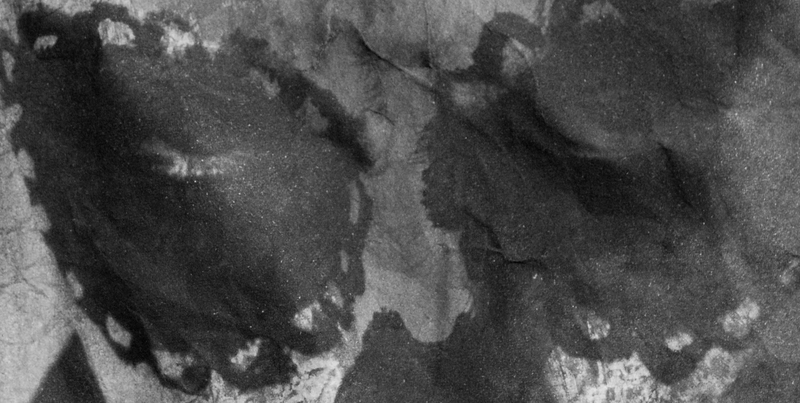 I’ve wondered whether there is an artist who has considered drawing a distinctive male or female skull? This is an interesting question that I’ll need to examine further, don’t worry I will return with the answer! Are you curious to discover an interesting fact? 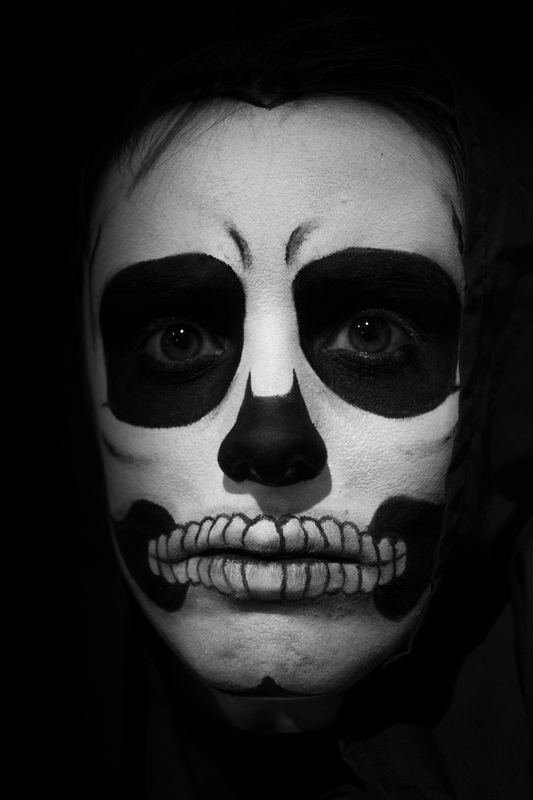 About three to four months ago, I started writing a blog post exploring male and female skull makeup designs in order to identify whether the interpretation of death varies depending on the person’s gender. There were some interesting arguments relating to this particular subject and I definitely required additional time time to digest all of the information. I’ll have to return to the post and complete the blog post once and for all. Discovering new articles or posts can provide new ideas and perspectives that inspire me to explore new elements or revisit old territories. Now you’ve reached the end but the journey doesn’t end here, I shall return with another fascinating post in the next few days. This particular assignment encouraged me to examine the audience, demographic and the readers who may visit the blog. This is a very interesting exercise that involves writing for an intended audience or reader in mind, although I dedicated two days to brainstorming in order to determine, who is reading Black Calavera? While I don’t have a particular person in mind, I hope to share the research I’ve undertaken over the past few years with the outside world. Now that I’ve switched to my focused state of mind, I would imagine the ideal reader as a skull enthusiast or an artist with a strong interest for skulls. The second component involves introducing a new element to the blog and I wondered whether there is something new I can possibly explore that is different to what I’m familiar or comfortable with. I was intrigued to explore illustration or drawing that is something that I haven’t practised for about a year now. For two whole days, I sat beneath the heater with a pencil and an old sketch book that was recently discovered in the bottom of a cardboard box; this basically summaries the length of time I haven’t practised my sketching. With two to three attempts, a sugar skull illustration was finally created! I can be rather picky, although the objective of the exercise involved experimenting with a different medium and the test determined that I can push beyond my comfort zone. 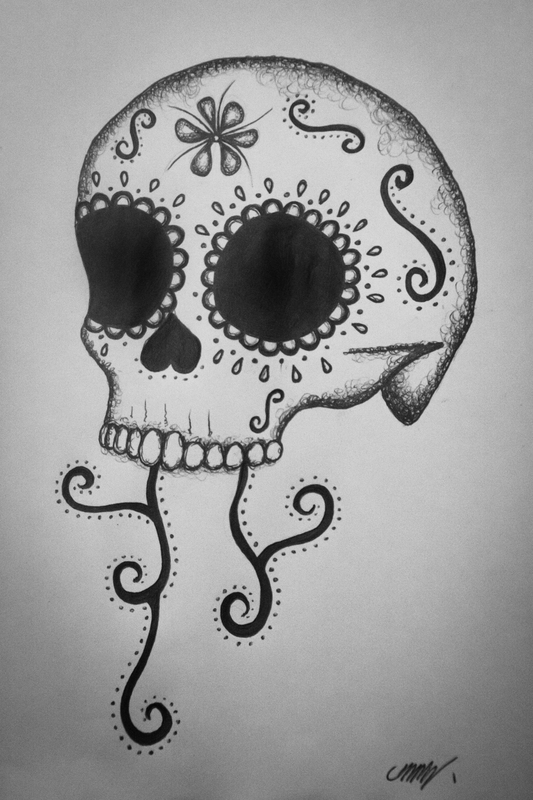 With additional practise and persistence, the sugar skull illustrations will improve over time. This is the starting point anyway and the sketchbook will hopefully provide new ideas for upcoming projects. The sugar skulls are highly colourful, although I’m intrigued to explore the decorative designs in black and white. Another fascinating subject, is the interpretation of death and how would one describe this ambiguous subject? This is something I’ve questioned over and over again, although death is one of those mysterious occurrences that is a natural process of life, although the thought is relatively daunting at times. I’ve actually awakened from a good night’s rest and realised that I perceive the world through my own point of view and one day that’ll eventually disappear, when death approaches. This is actually difficult to explain, although I experienced a sudden wave of anxiety when I realised that there is an ending, there are some things in life that are unavoidable and death is one of them. So where do we go from here? Good question, well I would love to explore how others interpret death, perhaps this’ll transform into an exciting new project, you’ll have to wait and see. Day Three, Blogging 101 Continued: These Top Five Blogs are Absolutely killer! I’m back ready to write another post and I would love to share a few of my favourite blogs on WordPress. As you may have guessed by now, I’m participating in the Blogging 101 course that has enabled me to re-evaluate the purpose and the significance behind Black Calavera. This particular exercise for the week involved writing a post in regards to my favourite topics or blogs that is exciting because I thoroughly enjoy browsing through my reader and discovering new posts, articles or reviews. Here they are, starting with number one. If you haven’t visited this blog and you have an interest for horror, remember to check out this site! Eva Halloween is the author of the blog who posts a range of fascinating articles relating to Halloween, horror and paranormal activities. I throughly enjoy reading the makeup tutorials, DIY instructions and costume competitions that are definitely inspiring and creative. At a young age, I developed a fascination for horror and The Year of the Halloween is the perfect match! There are so many different articles to read through and the different subjects are seriously fascinating. There’s nothing I love more than a scary horror film or a cheesy b-grade horror movie. Well lucky for me, there’s Horrorpedia that presents a range of fascinating and entertaining reviews in regards to classic horror films, international blockbusters, and independent cinema. The list doesn’t stop here, Horrorpedia also includes other artistic influences including music, literature and digital media that explore the exciting world of horror. This is a really resourceful site and there are plenty of trailers, interviews and video clips to watch for all of your horror needs. Plus there’s a section dedicated to the “worst horror movies of all time” with a large selection of the most outrageous z-grade films I’ve ever seen! This is definitely the highlight of Horrorpedia, if you love watching those kind of films that are so bad they’re good, you will absolutely love this section. I was immediately intrigued by the Parlour of Horror that features reviews in regards to literature, cinema, art and real life events. My favourite posts are the film reviews relating to classic horror and new releases that I can definitely add these to my list of movies to watch. The site also features some fascinating posts relating to horror art, where I discover artists, photographers and writers who explore dark and sinister subject matter. There is a great deal of inspiring and engaging information to read through and if you’re interested in horror, I would definitely recommend the Parlour of Horror. 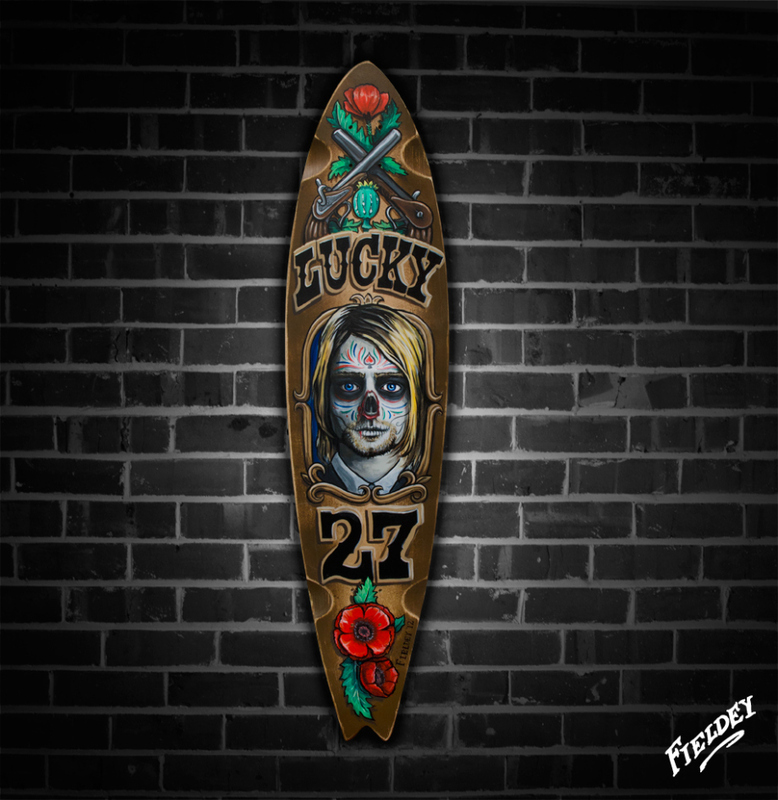 Now you’re in for a real treat, as a Fieldey is a contemporary artist who creates the most inspiring skateboard and surfboard designs. They’re colourful, artistic and captivating; the designs feature extraordinary detail and aesthetics that provides me with the urge to browse through the entire collection! Of course, my favourite works are the Day of the Dead designs, if you’re a skull enthusiast you’ll absolutely love Fieldey’s collection of skateboards and surfboards. The site also features commissions, tutorials and a wicked gallery full of inspiring works. Last but not least, is Craniophiles that is right up my alley! This marvellous site delivers a series of blog posts that examine the human skull from an artistic, historical and scientific context. As an avid skull enthusiast, I cannot contain my excitement when I discover a blog with reviews and articles relating to the human skull and Craniophiles features a large collection of fascinating posts investigating this particular subject. Have an interest in art or science? No problems, Craniophiles has the information you’ve been searching for! Hey there, I know it’s been a while since I’ve posted, although I have recently discovered the most extraordinary performance artist that I have the urge to share! Marina Abramović is internationally recognised for her inspiring, captivating and conceptual performances that provoke a powerful and emotional response from the audience, as referenced by Sean O’Hagan.1 I’ve recently watched a documentary known as, The Artist is Present that presents Abramović most iconic and fascinating performance at the MoMA Museum of Modern Art. According to the MoMA audio recording, Marina Abramović explains that the skeleton exposes the frightening perceptions surrounding death and the concept of facing mortality.6 This is quite a confronting piece, as the juxtaposition between the artist’s figure and the skeleton invites me to consider my own mortality and my impermanent presence within the world that is a relatively scary thought at times. The performance delivers a powerful and emotional response that is admirable and inspiring. If you ever get the chance to watch The Artist is Present, I would definitely recommend it, even if you’re not into performance art, this will provide a completely different perspective in regards to art and the surrounding world. The documentary invited me to understand the importance of being present and aware of the your surroundings internally and externally. Don’t forget, rent or buy a copy of this documentary, you will seriously be amazed! 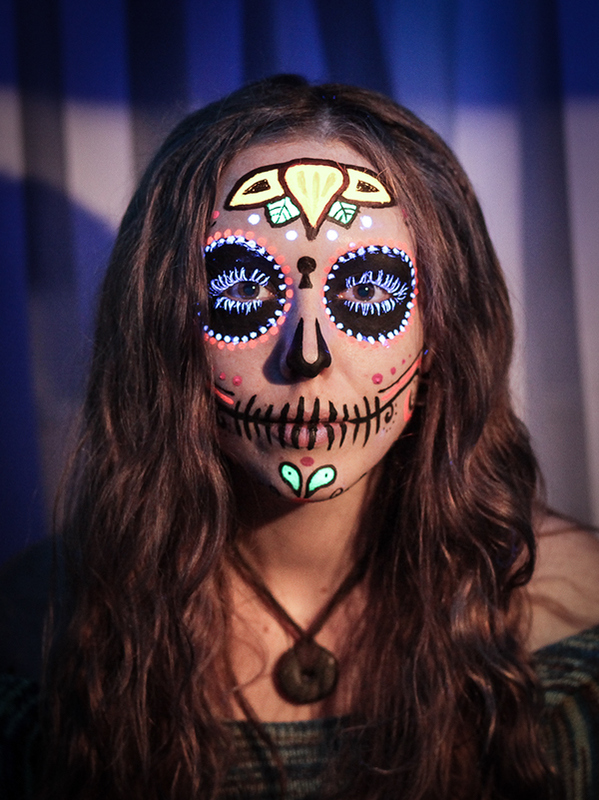 Last Week, I discussed my favourite sugar skull makeup designs that feature a range of highly creative and decorative patterns or styles. 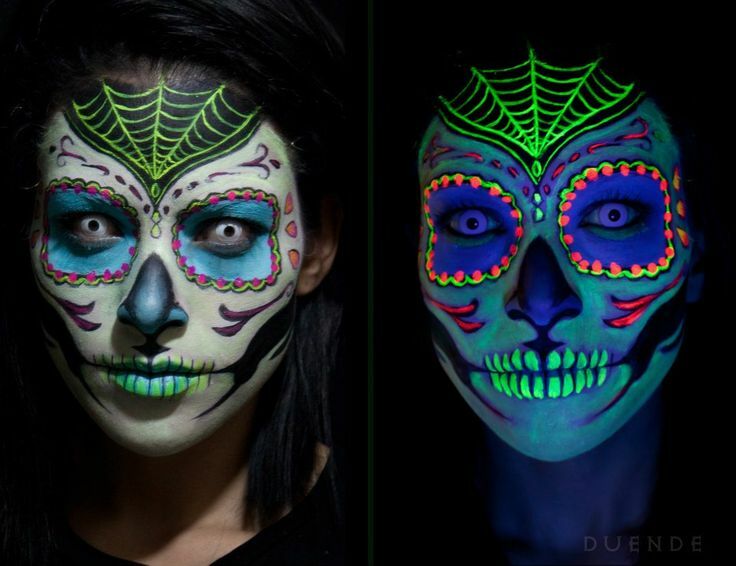 Over the past few days, I’ve discovered a series of sugar skull designs that are created with ‘ultraviolet / black light responsive makeup and body paint.’ These particular materials do create some spectacular, fluorescent patterns that provide a very artistic depiction of the Mexican Sugar Skulls. 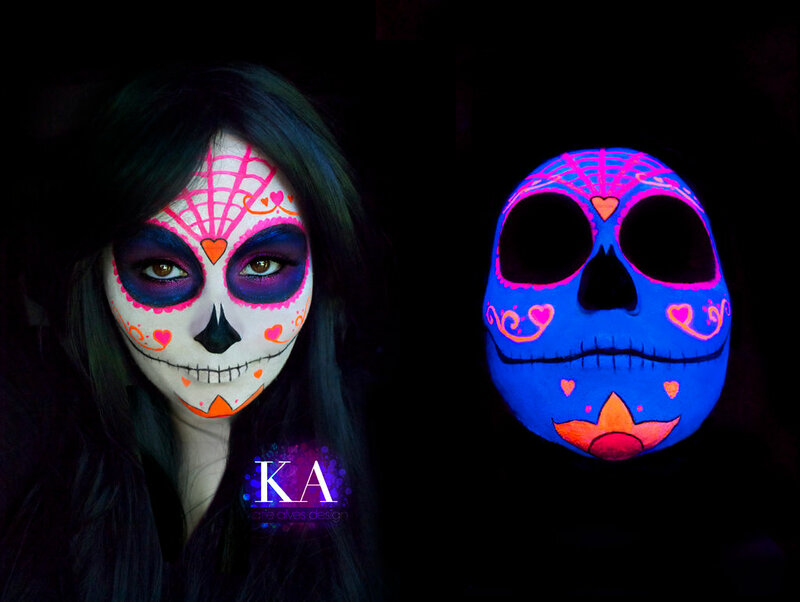 While there is a limited number of UV or black light sugar skull makeup designs online, I’ve discovered at least ten different styles that feature a high level of detail, intricacy and craftsmanship. At first, I struggled to search for some of the artist’s names or websites and I’ve spent a good few hours searching for all the relevant information. 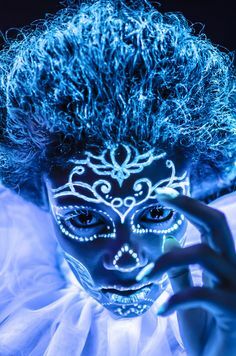 It’ll be interesting to see whether the UV sugar skull makeup / body paint becomes a fashionable or popular trend, only time will tell. 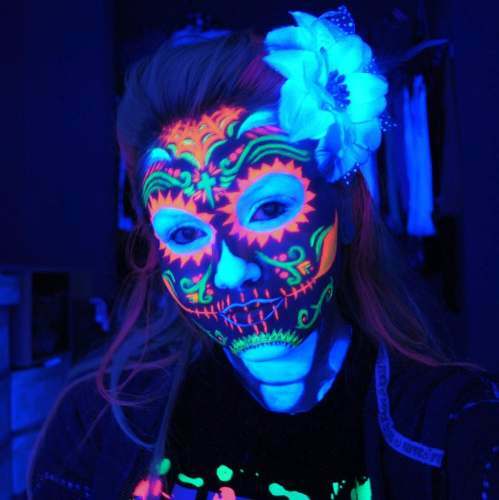 The black light and UV paint would definitely compliment your next Halloween outfit or celebratory event, you’ll immediately stand out from the crowd. What is Black Light Paint? 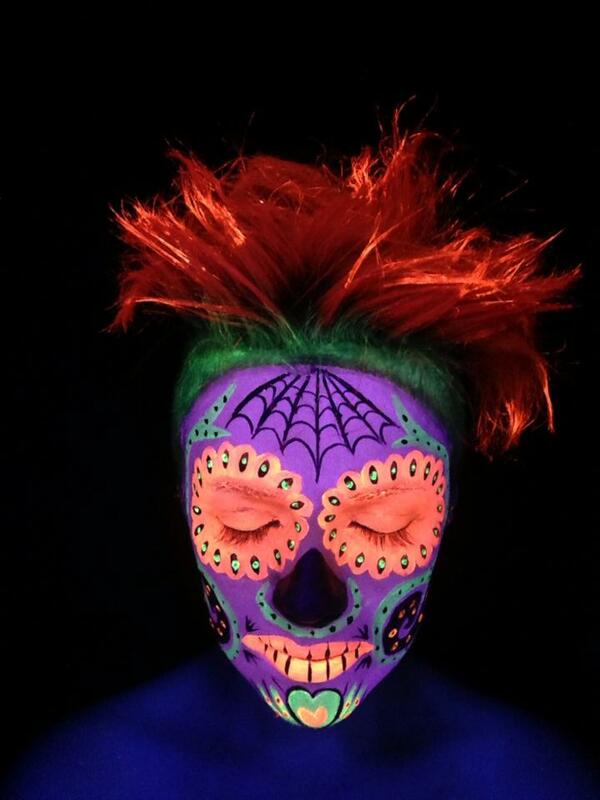 The black light is used for a range of creative or artistic purposes that does produce some fantastic results within a dark environment. David Cay Johnston from the new York Times explains that Joseph and Robert Switzer invented the visible, ‘fluorescent paint’ that is commonly known as Day-Glow. Robert Switzer severely injured his left eye, while he continued to unload packaged goods and he was confined to a dark space; this inspired the young chemistry student to experiment or research UV lighting. 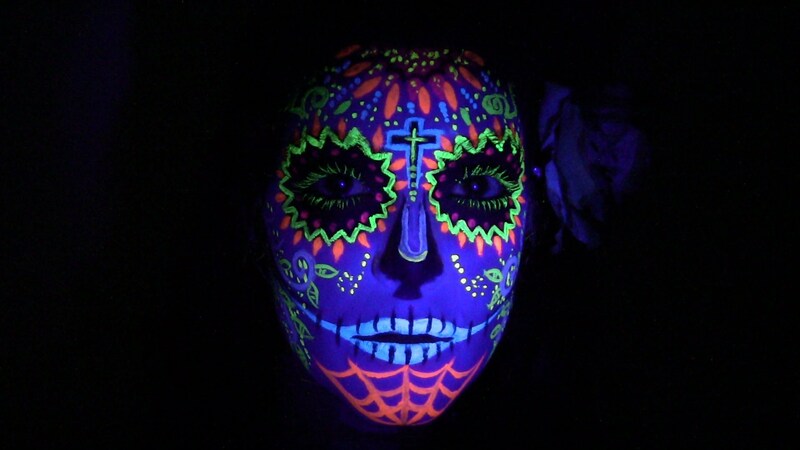 David Johnston suggests, “ultraviolet light goes in and its energy is converted into visible light emitted by the chemicals in the paint, creating the bright fluorescent quality.”3 The technical procedures and the back story is fascinating; the black light paint is now used for many artistic, creative and inspiring projects including the bright and colourful sugar skull designs. 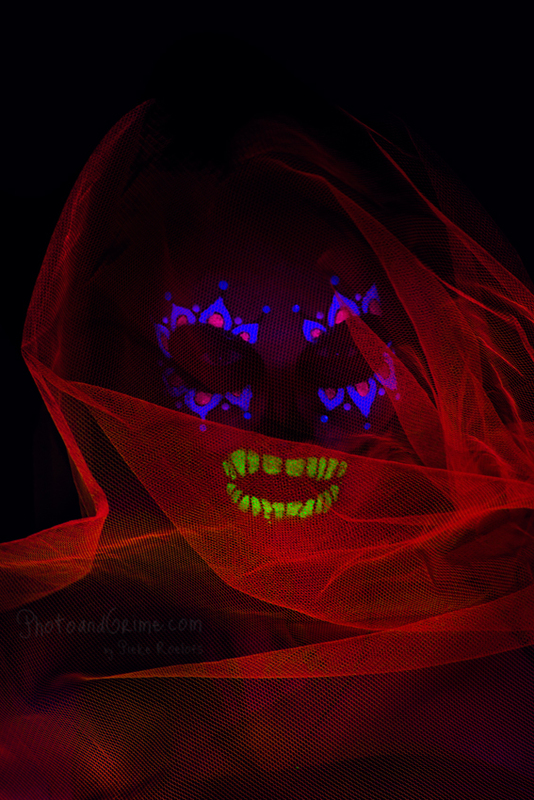 I’ve recognised many photographs that display black light or UV lighting and I began to research the actual process or equipment used in order to create these particular effects. Don Krajewski from the XOIND Studios recommends using a ‘black light’ in order to highlight the intended ‘subject’ as well as a particular material that will react to the black light. Krajewski also suggests experimenting with the manual camera settings including the exposure, ISO and lighting as well as the distance in order to achieve an artistic or stylised effect. I began to question whether the UV sugar skulls establish a closer association to death? I personally believe that the vibrant patterns and the dark background provides a very interesting composition between life and death. The decorative designs aestheticize the concept of death and the skull becomes a subject of beauty. This is such an interesting area of discussion that I’ll investigate over the next few weeks. 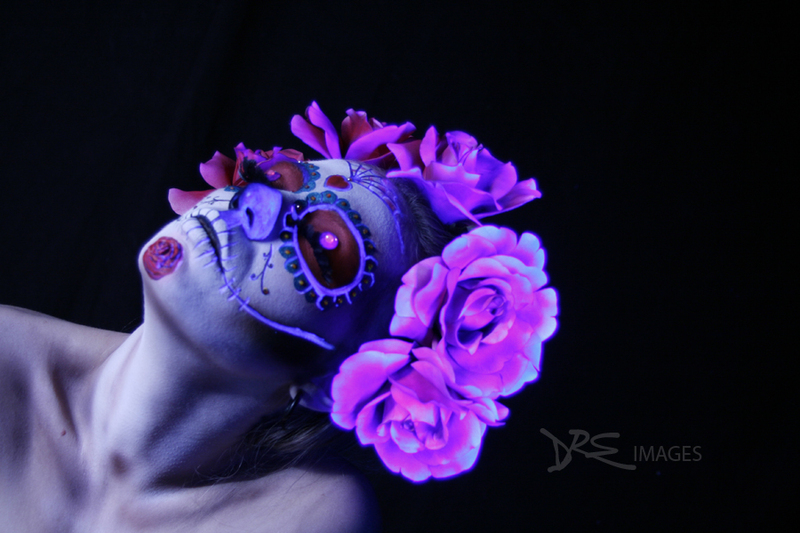 Since I’ve explore the sugar skulls, the black light paint / makeup has become an area of fascination that has provide a level of inspiration. While, I’ve focused upon the history and the overall process, it’ll be really interesting to continue researching this particular subject. Here are some other designs or photographs I have discovered; this is all for now, although I shall return shortly, goodbye for now. Skulls, Skeletons and Tequila, Espolón has it all! 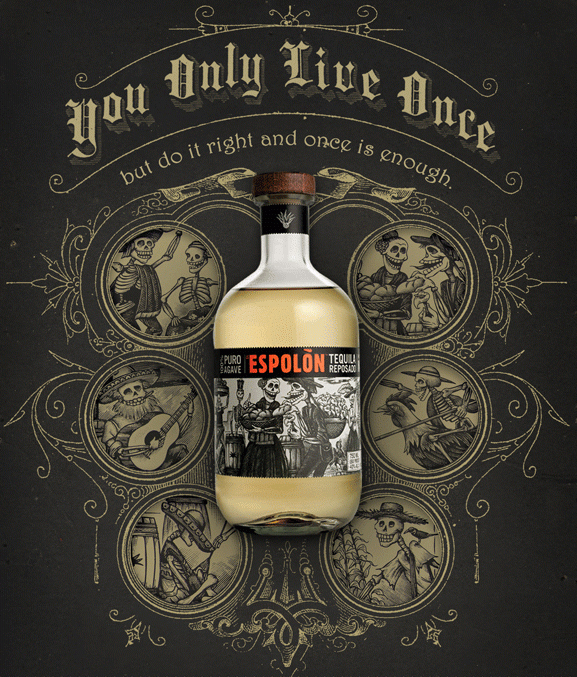 Espolón Tequila is one unique, innovative brand that features a smooth, delicate flavour along with a creative label that will leave a very memorable impression! As soon as I recognised the bottle of Espolón, I instantly developed to the urge to purchase a bottle for myself and the product design immediately attracted my attention. While I was tempted to try the tequila, I wanted to keep the bottle for the inspiring label / packaging. 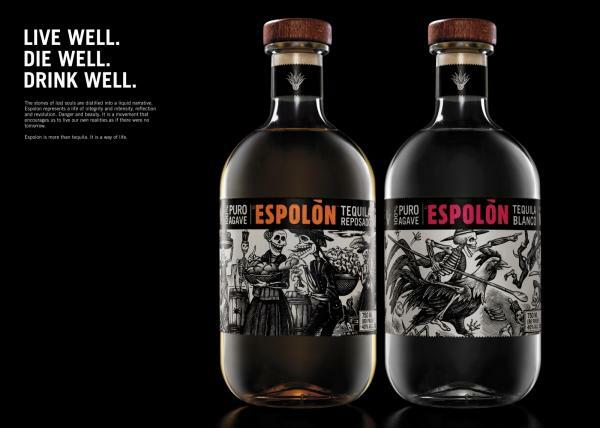 Espolón’s product design features similarities to the works of José Guadalupe Posada and there is an illustration known as the “The Calavera of Don Quixote 1910” that appears almost identical to the label; Espolon’s design presents a very distinctive appropriation that reflect’s Mexico’s cultural and historical background.2 I’m assuming that Posada’s prints would be available under ‘free use,’ this would be a very interesting area to explore or research in the next week. 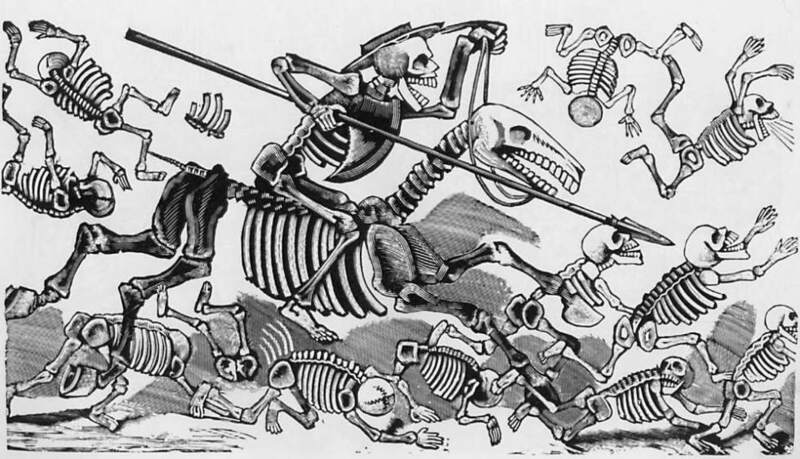 According to Regina.M.Marchi, Posada is an influential artist / printmaker from Mexico who produced a range of delightful prints or illustrations featuring a range of enthusiastic, animated skeletons during the 19th century. 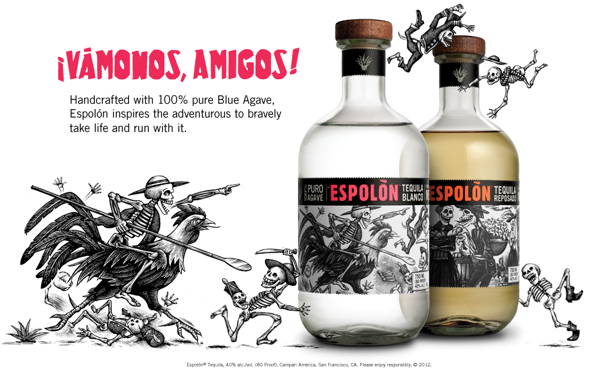 In the illustrations, the playful skeletons partake in a range of activities or events wearing a range of outfits or accessories and Posada’s distinctive style provides a humorous perspective of death, as referenced by Marchi.3 Espolón have used these lively skeletons to advertise their tequila, although I can’t see anything wrong with this, the story does feature some cultural associations or symbology that provides context to the overall brand. Espolón delivers a level of authenticity through the packaging or product design that is inspired by one unique symbol. This is a very interesting discovery that definitely adds a level of interest towards Espolón and the brand’s overall history. While I’m interested in researching the cultural and historical associations related to the brand, I do enjoy a glass of Blanco with a slice of lime. This particular type of Tequila works exceptionally well as a cocktail or a mixed drink and I would definitely recommend Espolón if you intend to create a Paloma or an Espresso Martini. The tequila also works as a delicious alcoholic beverage just by itself with some ice and a slice of lime. While there are other brands of tequila that feature an outstanding flavour, Espolón is exceptional for the price and it’s very affordable, especially for the overall quality! So if you’re planning a dinner party and you need Tequila for a dozen Paloma’s, this is definitely the one to go for! According to Espolon’s website, the tequila features “100% pure agave” that is created / distilled in “Los Altos, Mexico.” From a personal opinion, I do enjoy the Blanco compared the Respado that is aged for several months in an “oak barrel,” as referenced by Espolón.6 This is just my personal preference and I prefer something with a smooth flavour or texture. If you’re new to tequila, I would recommend the Blanco to start off with, if you’re searching for something with a strong, full-bodied flavour then the Respado is an excellent choice. Espolón features some very compelling, yet distinctive advertisements that are very admirable and the designs are created by Steven Noble. Last but not least, I thought I would briefly mention my recent discovery in regards to my statistics on my WordPress profile. This year so far, I’ve received 482 views for my previous post in regards to Espolón tequila that ranked number six on my top posts for 2015. This is a very interesting conclusion that demonstrates Espolón’s increase in popularity. Perhaps there is a demand for skulls and tequila, it’ll be interesting to observe the statistics overtime in order to view any significant changes. So if you enjoy relaxing on the deck chair with a refreshing glass of tequila, I would recommend Espolón! Not only will you receive a high quality product, you’ll obtain an awesome bottle with some incredible designs including skulls, skeletons and a rooster, what more could you possibly ask for? If you love skulls and tequila, this is the brand for you. Espolón also features a Facebook Page and a Twitter Page that is worth viewing if you wish to acquire further information! These amazing advertisements are created by Steven Noble, click on the link to view the artist’s Behance Portfolio. Hey there everyone, I finally created a Twitter page! I have wanted to create one for a while but I just needed to find the time, now I’m just getting used to all the different settings…this is kind of fun. I’m specifically using the social media sites as a way to record / reference my inspiration for future blog posts and reviews. I discover so many different artworks and designs featuring the skull, it’s often difficult to keep up with everything. I thought I would sneak in another photo with me experimenting with the skull makeup, I would love to create some additional patterns / designs and I’ll have all next week to devote to some experimentations, yay. I just need to work on the shadows and the shape of the teeth but I’ll release a post later in the week anyway. You can now follow me on Twitter, just click on the link below, stay tuned! Day Two of the Blogging 101 Expedition: What is the Skulls Project? Black Calavera undertakes Blogging 101: Here We Go!